Earlier last week, THW’s founder, Bruce Hollingdrake, posted an article that detailed the history of the Stanley Cup. After viewing the article, I was compelled to watch a DVD that I had purchased back in 2004. The DVD was entitled, “Lord Stanley’s Cup”, and I remember that this specific DVD had instant appeal to me, even as I was picking it out among a group of expensive DVDs. I wound up purchasing it for $10.00 and was not disappointed in the least bit as Denis Leary narrated a great 45 minutes about hockey’s ultimate prize. What was especially impressive about the DVD was the fact that it captured the essence of hockey and its fans. The DVD is selling for about $5.00 on certain websites, but it would be a great purchase for hockey and sports fans alike. Denis Leary depicts the history of Lord Stanley’s Cup and the sport through a collection of videos and commentary from hockey greats such as Lanny McDonald, Patrick Roy, Martin Brodeur, and hockey’s Great One, Wayne Gretzky. 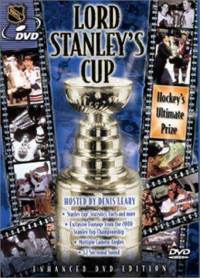 While “Lord Stanley’s Cup” was released in 2003, the DVD contains all types of footage regarding hockey’s history. The trials, tribulations, joy, and pain of attaining hockey’s ultimate prize are very well documented in this 45 minute video. The DVD started out with some background information on Lord Stanley of Preston and the formation of the Stanley Cup, which was roughly $48 in 1892 and was the size of a bowl. After spending a little bit of time on the Cup’s background, the DVD took a leap forward in time as Denis Leary broke down the two Detroit Red Wings championships from 1996-1998. Commentary from Steve Yzerman, Igor Larionov, and Nicklas Lidstrom illustrated the hunger that the Red Wings and their fans experienced as Hockeytown had not had a Stanley Cup championship since 1955. The breakdown of Detroit’s back to back championships was essential to the flow of the DVD as it transitioned into its “Cup Crazy” segment. This was arguably one of the DVD’s strongest chapters as it showed a montage of fans from different arenas going wild with emotion as they cheered on their teams from the stands. The sheer amount of Stanley Cup replicas, hairdos, and other Cup-associated materials would make any sports fan realize why hockey fans wear their emotions on their sleeves when Lord Stanley’s Cup is on the line. While the footage above is a bit grainy, “Lord Stanley’s Cup” illustrated just how demoralized Smith was, as he recounted, “How could I ever forget that day? That was the worst day of my life…”. On the other hand, Emile Francis’ recap of the 1972 Stanley Cup Finals and the way that Bobby Orr beat Gilles Villemure for the eventual Cup-winning goal in Game 6 also illustrated that a stinging loss in the Stanley Cup Finals can stay ingrained in one’s mind for decades to come. More importantly, the DVD detailed the way that certain players sacrifice their bodies in order to have a chance to hoist the Stanley Cup. Players are rarely at 100% come playoff time and commentary from Al Arbour and Bobby Holik illustrated that players would do almost anything in order to be able to suit up and play for hockey’s greatest hardware. The most detailed and painful portrayal of injuries was described by Steve Yzerman as he recapped the procedure that Brent Gilchrist would go through before games and between periods just to be able to play. Even though Gilchrist won the Stanley Cup with Detroit in 1998, the pivot literally played until his groin muscles were separated and forced him to retire. For all of the pain and agony that the Stanley Cup brings to hockey players, the ability to hold the Cup and be able to have such a prize for a day can be well worth the journey. The DVD detailed the places that the Stanley Cup travels to over the summer and what various players do with it when they have a chance to spend a day with a trophy that they poured blood, sweat, and tears into attaining. Lastly, the DVD had an interesting segment on Dynasties as various clips from the Islanders and Oilers’ dynasty years were replayed. Commentary from Al Arbour, Billy Smith, and Wayne Gretzky illustrated just how special it was for these individuals to maintain their hockey dominance throughout the 80s and what it took to win the Stanley Cup year after year. The Bonus Features for “Lord Stanley’s Cup” are really entertaining and make the DVD well worth the purchase. One can switch the DVD over to French if they please, but the highlights of the 1999 and 2000 Stanley Cup Finals are also worth watching. Even though the DVD only highlights Game 6 (deciding games) of each of the aforementioned series, the recaps capture the dedication and emotion that comes with playing in the Stanley Cup Finals. In addition to the 1999 and 2000 Stanley Cup Finals highlights, the DVD also contained video clips of clutch players such as Esa Tikkanen, Billy Smith, Patrick Roy, Bernie Parent, Terry Sawchuk, Grant Fuhr, and Claude Lemieux. Finally, the DVD has an option to view stats for a few players as well as a list of Stanley Cup Champions, Conn Smythe Trophy winners, and Hall of Fame players (up until the year 2001). All in all, I’d give “Lord Stanley’s Cup” a 9/10. Since the DVD sells for around $5.00, it’d be an awesome purchase and view for any hockey or sports fan that wants to see what the Stanley Cup and its tradition are all about.